Summer gives us a perfect opportunity to head out outside for some open-ended science play and experimentation. Just grab a few ingredients from your kitchen and a craft cabinet, and you have a ready made potions lab! 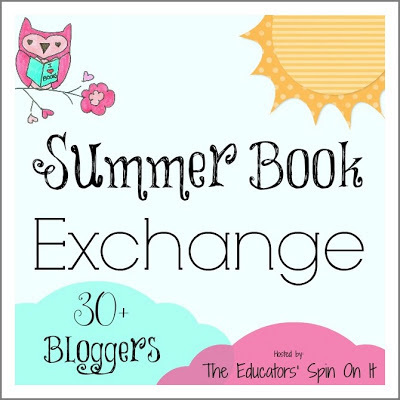 This year we signed up to participate in Summer Book Exchange organized by The Educators’ Spin On It. Our exchange partners were Laura who blogs on The Seeds Network and her 9 year old daughter. Smarty was delighted to receive a package from them and open it. I really appreciated the thought that went into selecting activities to go with this book to match the fact that my daughter is not a crafty girl. Smarty’s package included two activity suggestions – one was potion making with enough ingredients for a beginner potion maker and another one was making fossil prints with Crayola Model Magic packs. Smarty was especially delighted to receive a glass jar with a cork. She wanted a jar like this for the longest time and was thrilled to find it in this box. Laura and her daughter sent Smarty Ivy+Bean: The Ghost That Had to Go book by Annie Barrows. To be honest, I was not sure when Smarty would read it and whether she would want to read it at all. We tried the first book from Ivy+Bean when Smarty was in kindergarten, and she didn’t like it, because the girls in the book are not exactly following the rules all the time. Smarty still doesn’t like it when characters in the book break the rules unless they are in mortal danger. However, the letter from Laura and her daughter suggested to read the book first to see how their activities fit into the book, and Smarty grabbed it right away (yes, she is a very rule-oriented child). 20 minutes later Smarty came to me and said that she is done with the book and wants to do potions now. See, our 7 year old is apparently a self-taught speed-reader just like one of her favorite characters Sticky Washington in Mysterious Benedict Society by Trenton Lee Stewart. I just wish she had the same perfect recall! Setting up a potion making lab is very simple, especially if it’s done outside. 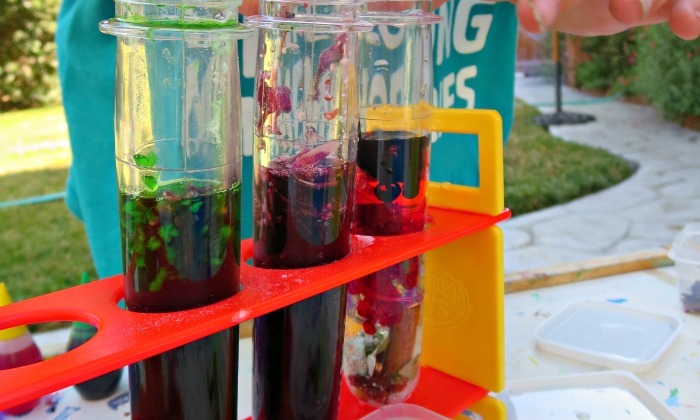 A package from The Seeds Network already contained soda, fine glitter, and, most importantly, food coloring. A brilliant touch from Laura and her daughter was adding cinnamon and cloves to the list of ingredients to help my little potion maker to focus not just on color but also on smell of her potions. I added our trusted set of test tubes (they came with Lab in a Bag science kit and were the most useful part of it), a pitcher of water, and some vinegar. A minty-green Life Protection Potion included herbs, crushed garlic to ward off vampires, cloves, my hair, and her hair (she was just reading about a polyjuice potion in Harry Potter). A dusty red Love Potion had glitter (of course! ), rose petals, lavender, and cinnamon. A pretty purple Flying Potion needed feathers, blue flowers from our garden, soap (to make feathers slick). Smarty actually smeared that potion all over herself hoping that she might fly. Well, she jumped really high! Smarty set aside her special glass jar for a drinkable Growth Potion. DISCLAIMER: Smarty is a healthy 7 year old with no known allergies, and I observed what she is putting in this potion, so I was OK with her trying it. In general, we hold to the rule that scientists don’t taste their ingredients. Her growth potion included herbs from our garden, salad leaves, crushed garlic, and some food coloring. Smarty is tiny for her age, so she is hoping that this potion works. In fact, she even asked Papa to measure her before taking it to track her progress. 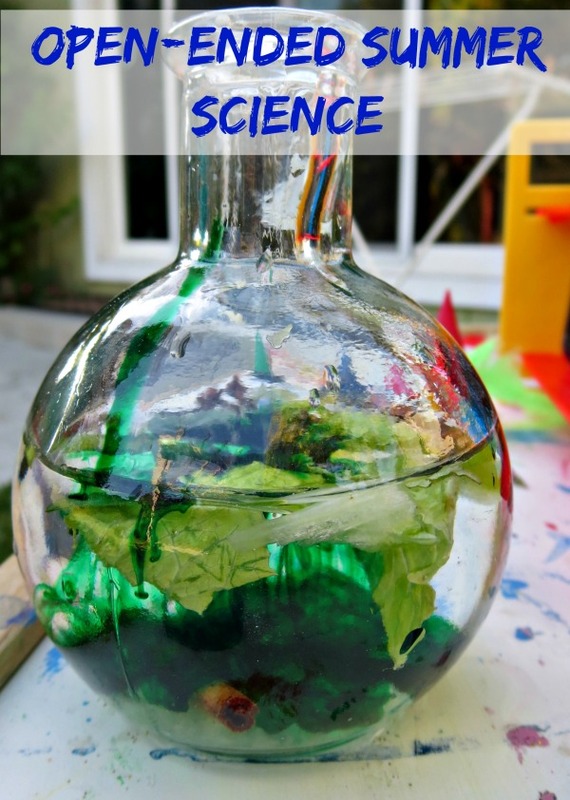 Have your turned your children loose with potion making ingredients yet? Follow my Science Pinterest board. What a fun activity! 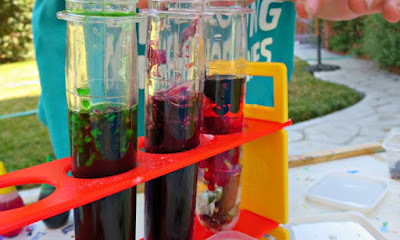 My kids do make a lot of potions using dirt, sticks, and leaves. They would really enjoy food coloring and spices! The first thing the kids ask whenever we're mixing anything up is whether it's edible or not. I like that bottle, too. Smarty ought to be able to have great fun with it all summer! Several years ago, K went wild making perfumes using flowers and oil. But we discovered oleander was poisonous from a friend so she always asks if the flowers are safe. We just learned that Calpurnia's granddad is a scientist who is into distillation and drinks his concoctions. So some scientists drink their potions! Potions are great because you can add whatever you have on hand at the moment. Great timing with Smarty just getting into Harry Potter too! Mine are turned loose with various kitchen supplies and use them for making "cookies," which really just means making a gloriously huge mess and mixing lots of sugar and vanilla together. I'm rather confused by this concept of a rules follower, I don't have any of those, they're more of the leap first and then find out what happened type. Oh I like that potion making table. That is definitely something my kiddos would drive right into! The potions lab is super cool! It's funny, when it comes to eating food, 3/4 of our kids are picky, but they have really expanded their sensory limits when it comes to food-based experiments, like this. Thanks for sharing. My kids would love that potion making set up!I love that you let smarty decide to drink it or not, how did it taste? Like a liquid salad? Like a hybrid of V8? I love this!!!! 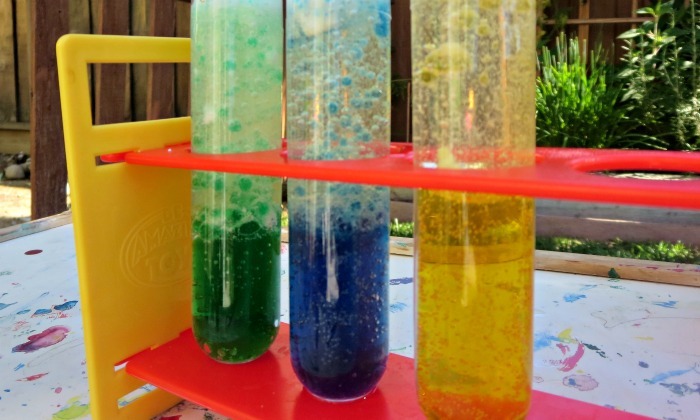 I remember making potions when I was a kid, but I don't know if my own kids have explored this yet:). I am she enjoyed the book and potions we sent! (Wow, she is a fast reader!). And my daughter also loves Harry Potter ... and that is probably a good reason why both girls love the idea of potion making! I also love how she made (and named) some of her own potions - such a fun activity!